Just as with the Fourth Sunday of Great Lent, when we commemorate St. John Climacus, so also on the Fifth Sunday of Great Lent, we commemorate St. Mary of Egypt due to the fact that her primary feast day is on April 1st, and it was moved to the nearest Sunday because during the lenten period the celebration of saints is forbidden on weekdays (Canon 51, Synod of Laodicea) - although there are notable exceptions, such as the Forty Martyrs of Sebaste which falls on March 9th. Besides this, special attention is given on this Sunday to St. Mary of Egypt because her life is read during the Great Canon of St. Andrew of Crete which is chanted on the Thursday of the Fifth Week. In this she also shares something in common with St. John Climacus, whose book the Ladder is read especially in monasteries during the entire lenten period. This attention is focused on her because she is the ultimate model of repentance, which is what Great Lent is primarily all about, and in her life it is recorded that St. Zosimas encountered her during his excursion into the desert for Great Lent, which indicates to the reader the time her life should be reflected on, and she reposed on Holy Thursday after receiving the Divine Eucharist. The first time we encounter the celebration of St. Mary of Egypt (whose life was first recorded in the seventh century by St. Sophronios of Jerusalem) on the Fifth Sunday of Great Lent is in a manuscript from the Patriarchate of Jerusalem in the year 1201, and slowly by the end of the fourteenth century we start seeing it in many other manuscripts. 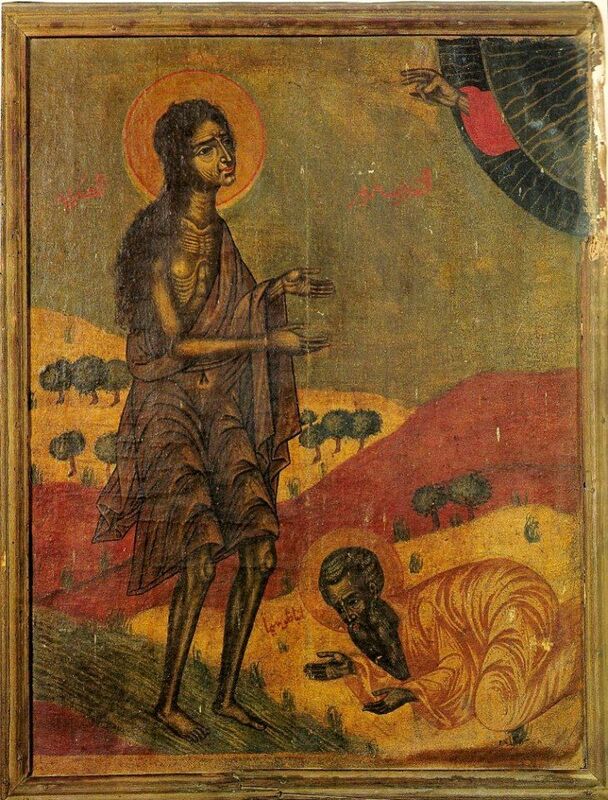 Thus, by the end of the fourteenth century, it seems like St. Mary of Egypt was firmly established to be celebrated by all Orthodox on the Fifth Sunday of Great Lent. Prior to this time, however, the primary focus of the Fifth Sunday of Great Lent was on the Gospel reading dedicated to the Parable of the Rich Man and Lazarus (Luke 16:-19-31). This is probably due to the fact that it speaks of the necessity of repentance and showing mercy before death, since after death there is no repentance. The oldest manuscripts of the Triodion testify that this parable was the focus for this Sunday, as well as the fourteenth century homily (Homily 13) of St. Gregory Palamas, which indicates that St. Mary of Egypt was not commemorated in Thessaloniki in his time, or at least she is not mentioned even though the homily is focused on fasting. A reference to the Parable of the Rich Man and Lazarus can still be observed in the Matins service, right before the Canon to St. Mary of Egypt is chanted. It seems like in the fifteenth century the Gospel reading for this Sunday changed to Mark 10:32-45, which speaks of Jesus going to Jerusalem and predicting His death to His disciples. The change probably took place due to the emphasis on the Gospel of Mark during the Sundays of the lenten period (the Gospel of Luke used to be emphasized on the Sundays of Lent), and it falls chronologically in line with the events of Holy Week.